Apple kicked off the first wave of iPhone 8 and 8 Plus pre-orders today and the initial stock is already beginning to dwindle. At the beginning of the day buyers from most of the 29 countries that made the first wave of sales were seeing shipping times between 22 and 25 September but now shipping estimates are falling back to between 1 and 2 weeks. It depends on the market you're looking at. Italian users still see the 22-25 September shipping estimate. 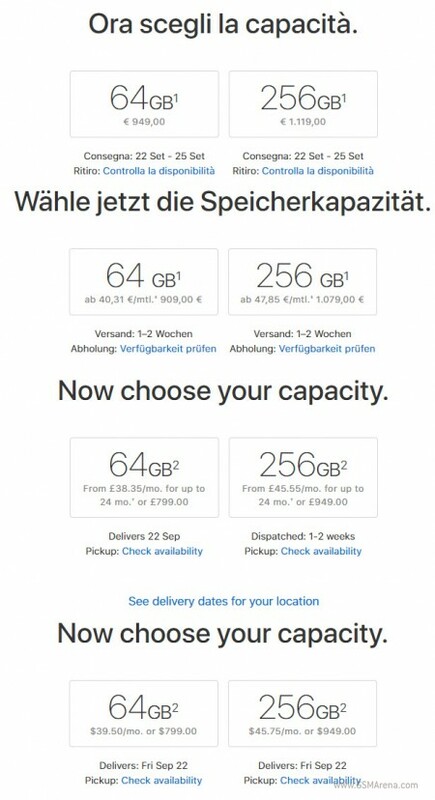 UK buyers of the iPhone 8 Plus can still get a 64GB model and it will arrive on 22 of September and US customers get the faster shipping estimate as well. But the shipping date depends on the model, the capacity and the country and stock is bound to deplete soon. You can check on any regional Apple site to see the dates for your region. The Apple Watch Series 3 has a shipping estimate of 2 to 3 weeks. well, that's according to you! lol Apple itself as a whole is a big gimmick! overpriced gadgets! and 2014 specs!